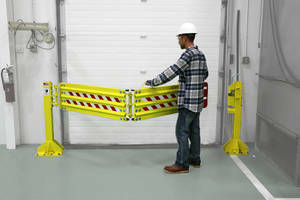 Our Defender Gate and Defender Net Barriers have been going through some major transformations. US Netting and our team of engineers, designers, managers, and sales have been researching and iterating on the product line in almost every way. Construction, fabrication, strength, operation, and safety are just some of the areas improved with the newly upgraded Defender Gate 10, Defender Gate 20, and Defender Gate XL. The improvement of strength operation and client usage continue to go beyond our imagination. Added use-cases prompted us to refer to the original "Loading Dock Safety Net" as the Defender Net. We know, another name may not be necessary but, the Defender Net currently serves as so much more than just a simple Loading Dock Safety Net. 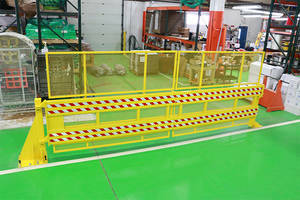 The Defender Net is often a safety barrier, machine guard, mezzanine guard or as in-plant separation. With the addition of the newest attachment "The Existing Bollard Ring" allows the Defender Net to be attached anywhere you have existing bollards. After all the changes that we've made to the gates, we wanted to be sure our products were tested and vetted to work better than originally planned. As a team, we tested in real-world conditions with the actual sizes and speeds of forklifts commonly used inside of our client's facilities. Improvements emerged throughout our testing process, and some came from the mouth of our customers, users, and installers. US Netting is extremely excited to share these findings with you. First things first, the Defender Gate and the Standard Safety Gate are receiving a name change after the testing phase. We felt that the names were a bit too confusing. Now, both of the gates are designed and engineered to withstand the same amount of impact. The main difference between the newly named Defender Gate 10 and the Defender Gate 20 is that the 20 has a secondary, lower guard rail to protect against crawl-thru. Although, this can be mitigated using the Defender Gate 10 with the use of the newly designed Crawl Guard attachment. We wanted our customers to be able to extend the single rung of the DG-10 also. The Defender Gate 20 also allows for an additional height blocking attachment named the Security Guard. The Security Guard add-on extends the top rail up to 72" high to assist in guarding against crawl over and works excellently as a protector for an opening such as a tool crib, lockout box, or any hazardous area in need of protection in a warehouse or other facility. 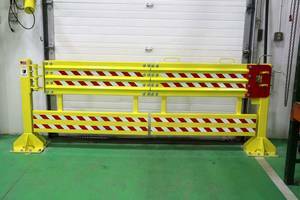 The Crawl Guard as stated before is available as an add-on for The Defender Gate 10 which blocks from the under the rail to the floor to stop personnel from crawling under the gate as well as forks sliding under and puncturing your overhead doors. The Defender Gate 10 and 20 now have an improved leveling system with heavy duty leveling bolts that make it even easier to level your Defender Gate on uneven pavement. Our gates are the only safety barriers we know of that contain a leveling mechanism that makes sure that the safety barrier is level in front of the protected area. It was important that we added this feature to ensure that installation was as pain-free as possible. Also, the bollards gussets and method of welding were all improved with higher quality flux core welding to ensure the bollard can sustain as much impact as possible. Another feature on the DG10 and 20 was the addition of a gate opening adjustment. We were approached by a customer who was worried that the gate would swing into the other forklift lane by accident or just by moving quickly. A dock worker may be in a hurry and open the gate and throw it off to the side; this gate would swing into another forklift lane causing an obstruction. The gate opening adjustment is a simple device that limits the angle at which the gate will open from 90 degrees all the way to 180 with 15-degree increments. 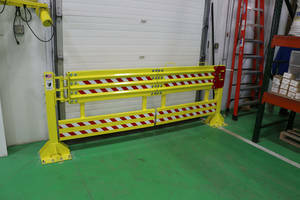 This improvement adds additional safety functionality to an already sturdy and safe safety barrier gate. Now that we've upgraded the gates, it was imperative to get an accurate impact rating. We rented several forklifts at different weights and sizes to see how the gates and our net would handle the impacts. The most common used forklift that we got was a Stark forklift at right around 10,000lbs. This fork truck was governed at 4 miles per hour from the factory and made it easy to ensure that we were impacting the gates and net at an even 4mph. All three of these products sustained the 4mph hit and stayed fully in-tact. To up the ante, we brought in a Hyster at 13,500 lbs. The 13,500lb lift impacted the gates at 4, 6.5, and 7.1 miles per hour. We used tracking software to check that we had the correct testing speeds and measured the rate of impact accordingly. After pouring over the data collected, we can now proudly state our ratings on the gates and newly named Defender Net. The Defender Gate 10 has an impact rating of 13,500lbs. Traveling at 6.5 miles per hour. As said before, the DG10 and DG20 both have the same impact ratings. The Defender Net we are referring to with the updated safety specs is the Post Mounted Defender Net. Its new impact rating is 13,500lbs. At 5 miles per hour. The new impact rating is an improvement over the former 10,000lbs. at a 4mph rating. Testing has been a learning experience for all of us, and we want to ensure that we provide the safest working conditions for our customers. All of our employees were involved in the process of testing our products. Our sales team was on-site to watch the tests and ask any questions and take notes and fabrication was also there to review the pieces of the products that withstand the most beating. The testing phase was a point of growth for each of our respective departments which enables them to be able to convey the strength of our gates and net to our interested parties. The Defender Line now boasts the highest impact rating in the industry. We exceed all of the impact ratings claimed by our competition. Other than the DG10, DG20 and the updated testing for the Defender Net, we have been hard at work developing and strengthening the DGXL or Defender Gate XL. We have engineered a much stronger bollard with a large gusset to provide the much-needed assistance to hold the amount of leverage created by such a long gate. Additional upright bars were added between the two rails to add stiffness to the actual gate, and strengthen the barrier overall. 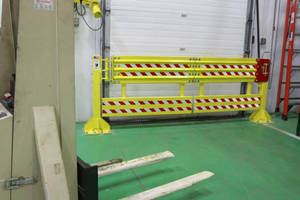 You can see by the images that the safety barrier is much beefier and also can add on the Security Guard which will now guard against 6" to the floor and up to 72" above the 14, 15 or 16-foot gate. We are excited to be the only barrier gate with a 16-foot width that can also extend up to 72" high and all the way down 6" from the floor. Be sure to review and watch the videos. We also have videos for each of the new accessories the Crawl-guard and Security Guard attachments. There are all sorts of new images and video surrounding the Defender Gate XL also. There isn't a better way to see how the gates react to the impacts than to see them in real-time. For any other questions or comments that you might have regarding our Defender Gate and Net products don't hesitate to give us a call at 1-800-331-2973 or you can always email us at sales@usnetting.com .